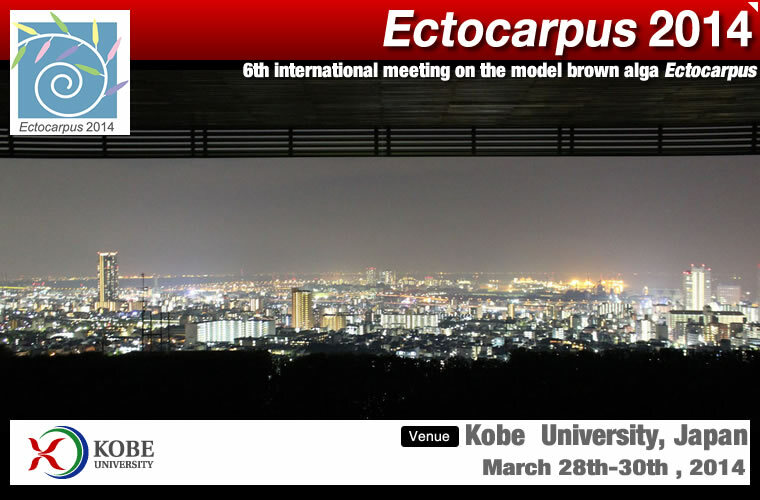 We cordially invite you to “Ectocarpus 2014 meeting”, a meeting centered on the model brown alga Ectocarpus that will be held at Kobe University (Kobe, Japan) from the 28th to the 30th of March 2014. The last Ectocarpus meeting, hosted by the Marine Biological Station, Roscoff in 2012, focused on how the Ectocarpus genome sequence was being exploited to explore diverse aspects of brown algal biology and to understand evolutionary mechanisms across the eukaryotic tree of life. Since the last meeting, a number of studies have used genome information to analyze biological phenomena. Moreover, the amount of macroalgal genome information available has dramatically increased with the release of a number of red algal genomes. One of the aims of the Ectocarpus meetings is to foster interactions with groups working outside the Ectocarpus community, and we welcome groups working on other multicellular algal species including freshwater taxa. The Ectocarpus 2014 meeting will feature invited talks from keynote speakers in research fields related to development, functional and environmental genomics of brown algae as well as other multicellular algae (e.g., red algae, green algae). Ectocarpus meetings usually attract about 50 participants from a broad range of countries. The convivial scale of these meetings offers young investigators ideal conditions to discuss their research with more experienced senior researchers in a relaxed atmosphere. The meeting will take place at the main campus of Kobe University (Rokkodai Campus) in an international city, Kobe, Japan. 28th March 2014 (afternoon): Registration, welcome, invited lecture by Prof. Dieter G. Müller on the history of biological studies of Ectocarpus siliculosus, get-together reception. 29th March 2014 (full day): Keynote talk (Dr. Susana Coelho), oral presentations, poster viewing, meeting dinner. 30th March 2014 (morning): Invited talks (Drs. Jonas Collén, Kazuho Ikeo and Tomoaki Nishiyama), oral presentations, farewell. For those wishing to attend this meeting, and anyone wishing to present a contributed paper or a poster, please register on the Online Registration Site below. The deadline for early registration is 15th December, 2013. The early registration fee is ¥ 18,000 (¥ 13,000 for students). Registration fee after 16th December is ¥ 23,000 (¥ 18,000 for students). Online registration should accompany the payment of meeting fee by major credit cards or by domestic bank transfer to the following account. For bank transfer, please be advised that the above account accepts only domestic bank transfer in Japan. Bank transfer to this account from overseas will be bounced. If you have difficulty in paying by above methods, please contact Kinki Nippon Tourist (KNT) by e-mail (eckansai2@or.knt.co.jp). Delegates will need to cover their own costs for travel to/from Kobe and accommodation. Abstracts for oral or poster (or either oral or poster) presentations should be sent to ectocarpus2014@port.kobe-u.ac.jp using the “abstract submission form” before 15th February, 2014. Please download “abstract submission form” from URL. As to the type of presentation (oral/poster), due to limitations in the number of oral presentation slots, submitted abstracts will be reviewed by the Scientific Committee. Based on the recommendation of the Scientific Committee, the organizer may ask the author to modify the type of presentation from oral to poster. Please note that the final deadline of registration for those who give presentations (oral/poster) is the 15th of February. Only abstracts of the registered participants will be included in the abstract book.